I loved this episode so much!!!! When I started this episode, I didn't know it was that episode. What a visually delicious treat! The ode to the Coyote/Roadrunner, and if I'm not mistaken, also Martin the Martian and Daffy Duck (in addition to Bugs and Elmer Fudd) was spot on, from the setup of the gags to the sound effects and music. While I absolutely adored the animation, probably the one thing that stood out for me was the clever setup of drawing upon D'Argo's rage issues and his hurling of his blade into the cavernous chambers of Moya. At the beginning, it comes across, "D'Argo is just being D'Argo," but by the end, we learn his thoughtless action had seriously crave consequences for everyone. And Pilot, he doesn't get out much, so he reads a lot. Heh. This is one of those episodes that gets a lot of fan love, but it is not one of my favorites, probably because I didn't enjoy the Wile E. Coyote and and Roadrunner cartoons growing up (don't worry, I did like Bugs and Elmer and Daffy...). That being said, this is an ambitious, impressive episode following the gut-wrenching, heart-breaking episode where TalynJohn dies. 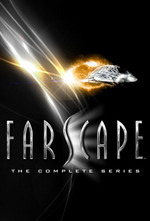 The Farscape companion book has a lot to say about it, such as the episode was conceived in Season 2, but David Kemper didn't want to do too many "wacky" episodes in one season, and Farscape had already produced "Won't Get Fooled Again." It took a lot of planning (they started the animation six months prior to shooting the episode) and they weren't sure what the finished product would be like. I think it's a successful episode and really original, just not one I rewatch regularly. Almost forgot! So, John technically dies in this episode, too. There is some speculation among fans that when he dies, TalynJohn's soul reunites with his and that's why he remembers/knows some things about his twin's time on Talyn.